The Dale Creek Bridge, located some twenty miles southeast of Laramie and four miles west of the Ames Monument, was the longest bridge on the Union Pacific transcontinental railroad. Completed in 1868 in southeastern Wyoming Territory, the Dale Creek Bridge presented engineers of the transcontinental railroad with one of their most difficult challenges, requiring them to cut through nearly a mile of granite. 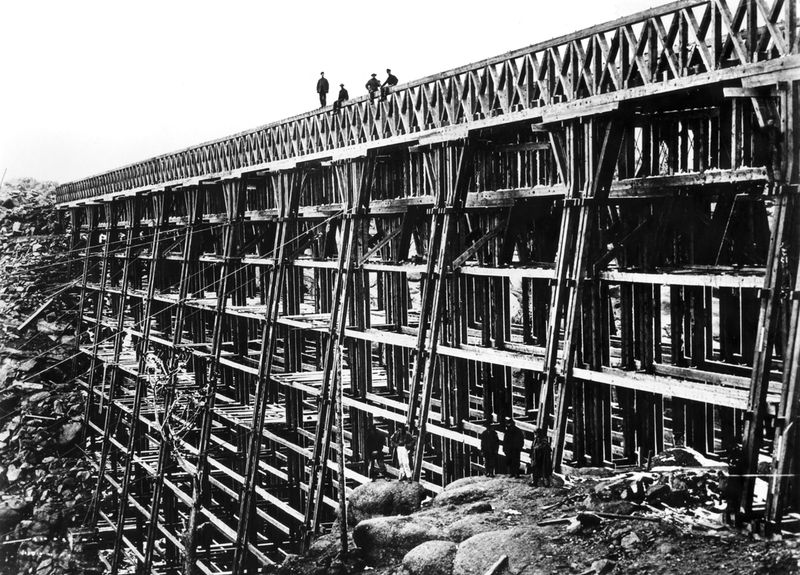 In addition, the trestle was originally built of wood, which swayed in the wind as the first train crossed the bridge on April 23, 1868. Carpenters rushed to shore up the bridge. In the mad dash, two fell to their deaths. Until the timber was replaced, the bridge flexed under the strain of passing trains. In 1876, the wooden bridge was replaced by an iron version constructed upon the same 1868 piers. In 1901, the distinctively tall Dale Creek Bridge was replaced, abandoned and later dismantled by the Union Pacific after the line was rerouted. Learn more about the Dale Creek Bridge and the Union Pacific Railroad.